Acknowledged author Frederic H. Martini wrote Fundamentals of Anatomy & Physiology (11th Edition) comprising 1296 pages back in 2017. Textbook and etextbook are published under ISBN 0134396022 and 9780134396026. 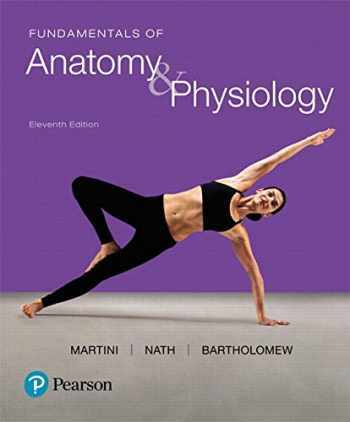 Since then Fundamentals of Anatomy & Physiology (11th Edition) textbook received total rating of 4.5 stars and was available to sell back to BooksRun online for the top buyback price of $60.84 or rent at the marketplace. For courses in two-semester A&P. Using Art Effectively to Teach the Toughest Topics in A&P Fundamentals of Anatomy & Physiology helps students succeed in the challenging A&P course with an easy-to-understand narrative, precise visuals, and steadfast accuracy. With the 11th Edition, the author team draws from recent research exploring how students use and digest visual information to help students use art more effectively to learn A&P. New book features encourage students to view and consider figures in the textbook, and new narrated videos guide students through complex physiology figures to help them deconstruct and better understand complicated processes. Instructors can also request a new handbook by Lori Garrett, entitled The Art of Teaching A&P: Six Easy Lessons to Improve Student Learning , which explores some of the most common challenges encountered when using art to teach A&P, alongside strategies to address these challenges. Also Available with Mastering A&P Mastering™ A&P is an online homework, tutorial, and assessment product designed to engage students and improve results by helping students stay on track in the course and quickly master challenging A&P concepts. Features in the text are supported by Mastering A&P assignments, including new SmartArt Videos, Interactive Physiology 2.0, Dynamic Study Modules, Learning Catalytics, Spotlight Figure Coaching Activities, lab study tools, Get Ready for A&P, plus a variety of Art Labeling Questions, Clinical Application Questions, and more. Note: You are purchasing a standalone product; Mastering™ A&P does not come packaged with this content. Students, if interested in purchasing this title with Mastering A&P, ask your instructor for the correct package ISBN and Course ID. Instructors, contact your Pearson representative for more information. If you would like to purchase both the physical text and Mastering A&P, search for: 013439495X / 9780134394954 Fundamentals of Anatomy & Physiology Plus Mastering A&P with eText -- Access Card Package Package consists of: 0134396022 / 9780134396026 Fundamentals of Anatomy & Physiology 013446950X / 9780134469508 Mastering A&P with Pearson eText -- ValuePack Access Card -- for Fundamentals of Anatomy & Physiology Mastering A&P should only be purchased when required by an instructor.